PhishTank started in 2006 with the idea to help make the Internet a better place by sharing free phishing data with the help of our online community. Over 5.3 million phishes have been submitted and 2.2 verified as valid threats. We’re still growing strong thanks to our community! You can already access PhishTank data via XML, CSV, PHP and JSON through it’s API. 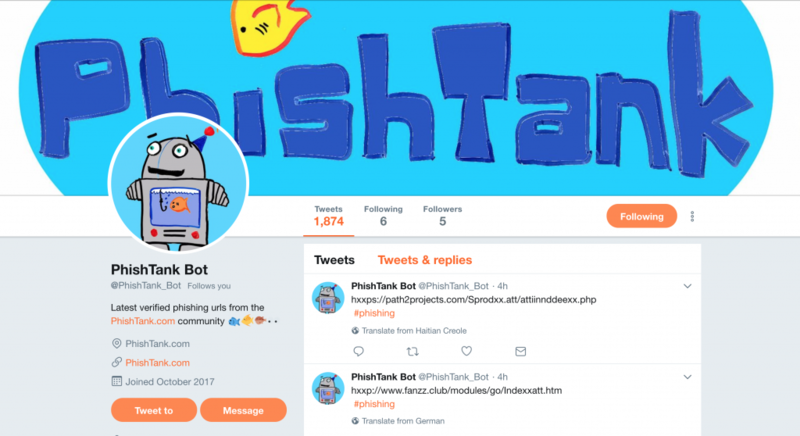 We’ve now created a new way to keep up on the latest valid phishing submissions: The @PhishTank_Bot twitter handle. PhishTank Bot will tweet the latest verified phishing URLs every hour. We hope that this will help provide a quicker look into the data available for our users that use Twitter for Open Source Intelligence Gathering. Phishing is one of the most widely used infection vectors for getting malware onto a system, harvesting user credentials and gaining unauthorized access to systems and information. PhishTank data is integrated into Cisco Umbrella and we use this intelligence to predictively block more threats and the related malicious infrastructure hosting the attacks. If you’d like to help in the fight against phishing visit the PhishTank website, where you can help by submitting suspected phishing pages or verifying other submissions. Thank you for helping to clean up the Internet!